Amid a chance of confrontation in Syria and a possible US withdrawal from the July 2015 nuclear deal, Iran’s Supreme Leader and Israeli Prime Minister Benjamin Netanyahu engaged in a high-profile war of words on Monday. 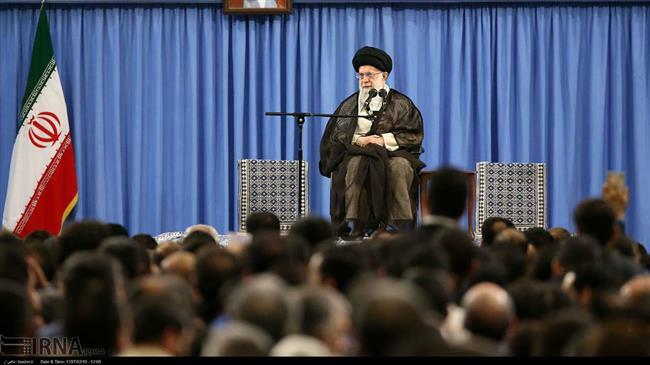 Ayatollah Khamanei called for Iranians to maintain resistance against an alliance of the US, Saudi Arabia, and Israel. Later Netanyahu presented a case insisting — based on a mysterious archive of “evidence” and in defiance of reports by international inspectors — that Iran has been pursuing a nuclear weapons program despite the nuclear agreement with the 5+1 Powers (US, UK, France, Germany, Russia, and China). The Americans are trying to provoke the Saudis and certain countries in the region and pit them against the Islamic Republic but if they have wisdom, they should not be deceived by the United States…. The Americans do not want to suffer the cost of confronting the Islamic Republic and the powerful nation of Iran themselves; they want to make some states in the region shoulder it. Some countries in the region should know that if they face the Islamic Republic of Iran, they will definitely be hit and defeated. Khamenei’s remarks came a day after new US Secretary of State Mike Pompeo visited Saudi Arabia and Israel, in discussions seen as consolidating an anti-Iran front ahead of Donald Trump’s May 12 decision on whether to continue the waiver of sweeping American sanctions on Tehran. He pushed his “Year of National Production” and a halt to foreign imports as the solution for problems which — apart from the sanctions — include rising unemployment, mismanagement and corruption, and a historic currency crisis. Supporting Iranian goods is one of the best and most effective ways to counter the economic designs of the enemies, because they have found out that they will not be able to succeed in a hard military war…. Why are some people insisting on buying foreign goods? What is this misconception and ailment? All government agencies and the people should decide to use Iranian goods. In a televised address from the Israeli Ministry of Defense, Prime Minister Netanyahu declared that his officials had been given an “atomic archive” from an Iranian secret compound, establishing Tehran’s pursuit of a nuclear bomb. IAEA inspectors have issued periodic reports setting out Iran’s compliance with the terms of the Joint Comprehensive Plan of Action, including Tehran giving up its stock of 20% uranium — for civilian use, but which potentially could be enriched further to military-grade 95% — and suspending research and development of a new generation of nuclear centrifuges. US intelligence services have assessed that Iran did have an undeclared nuclear weapons program, but halted it in 2003. Araqchi said the claims of the 55,000 documents is “ridiculous” because the Islamic Republic would never keep sensitive material in an abandoned area. The United States is aware of the information just released by Israel and continues to examine it carefully. This information provides new and compelling details about Iran’s efforts to develop missile-deliverable nuclear weapons. These facts are consistent with what the United States has long known: Iran has a robust, clandestine nuclear weapons program that it has tried and failed to hide from the world and from its own people. The Iranian regime has shown it will use destructive weapons against its neighbors and others. Iran must never have nuclear weapons. The White House later told reporters — while declining to issue a correction — that the statement was incorrect in setting out an ongoing nuclear weapons effort by Tehran. In seven years, that deal will have expired and Iran is free to go ahead and create nuclear weapons. That is not acceptable. Seven years is tomorrow. PreviousSyria Daily: Large Explosions at Regime Base Near Hama — But What Caused Them? IAEA inspectors have issued periodic reports setting out Iran’s compliance with the terms of the Joint Comprehensive Plan of Action, including Tehran giving up its stock of 20% uranium — for civilian use, but which potentially could be enriched further to military-grade 95% — and suspending research and development of a new generation of nuclear centrifuges. US intelligence services have assessed that Iran did have an undeclared nuclear weapons program, but halted it in 2003. The IAEA has never verified Iran’s compliance with Section T of the JCPOA pertaining to development of a nuclear warhead: https://www.reuters.com/article/us-iran-nuclear-iaea/iaea-chief-calls-for-clarity-on-disputed-section-of-iran-nuclear-deal-idUSKCN1C12AN The IAEA also swept the issues about Iran’s PMDs (possible military dimensions) under the carpet, after the nuclear deal was struck, for political reasons. It seems bizarre that the Israelis would have made off with all this archival material from a warehouse in southern Tehran. What shouldn’t be discounted is that powerful elements inside Iran opposed to the nuclear deal provided disinformation in order to undermine Rouhani and cause the agreement to collapse. That said, I am not going to claim that Iran doesn’t have an ambition to build nuclear weapons (I think they already have one or two bombs from plutonium they souced from the NoKos and Pakistan). Many Iranians, myself included, want Iran to have a nuclear arsenal. This includes those opposed to the current regime (the late Shah of Iran and his supporters almost certainly did).